A deliciously original thriller, spiced with wit, smoked with southern atmosphere, and served bloody. 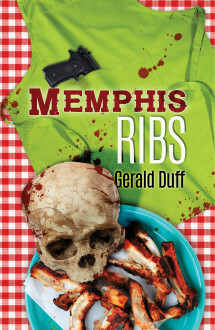 It’s May in Memphis, and four bloody murders occur on the eve of the International BBQ Contest and the Cotton Carnival: a conventioneer is stabbed at an ATM machine, a gang leader and his girlfriend are executed, and a wealthy local businessman is killed in his own home while his bodyguard is napping outside the door. It’s up to homicide detective J.W. Ragsdale to solve these seemingly unconnected crimes without scaring away the tourists who are arriving in droves. That’s not going to be easy. Ragsdale’s investigation pits him against a crack-dealing gang in the midst of a bloody drug war, a Memphis BBQ king struggling to hold on to his crumbling empire, a shotgun-wielding assassin, an East Coast mobster with a taste for BBQ and the blues, and the newly crowned Maid of Cotton, who will do anything to keep her tiara. Duff tells it with gusto and humor. And when it comes to describing the flavor of barbecue as well as the sights and sounds of a festival, Duff gives Calvin Trillin a run for his money. Duff's also got the local dialect and dialogue down cold. I loved Memphis Ribs. Duff is a Southern Elmore Leonard, only he’s a lot funnier.